New Zealand`s most popular propolis product, now also available in a double-PFL formulation, is made from highest quality propolis. Comvita Propolis Extract contains extracted Propolis solids dissolved in a glycol base, suitable for those wanting to gain the benefits if liquid Propolis ingestion. Propylene glycol, Propolis extract (106mg pure Proplois, equivalent to 303mg fresh Propolis). Take 1ml mixed in water. Repeat twice daily. Mix 0.5ml in 10ml water. Rinse in mouth and spit or swallow. If irritation or swelling of the mouth or throat occurs, discontinue use and consult a healthcare practitioner. Not suitable for children under 2 years of age, pregnant or lactating women consult a healthcare practitioner before use. Do not exceed recommended daily intake. Food supplements should not be used as a substitute for a varied diet and healthy lifestyle. 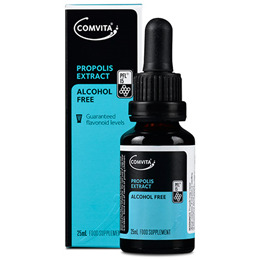 Below are reviews of Comvita Propolis Extract PFL15 Alcohol Free - 25ml by bodykind customers. If you have tried this product we'd love to hear what you think so please leave a review.